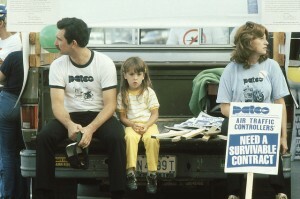 August 3rd, 1981: Approximately 13,000 air traffic controllers across the United States declare a strike through their union, the Professional Air Traffic Controllers’ Organization (PATCO). Their strike echoed the usual demands of the labor movement: better wages, better working conditions, a shorter workweek, and ultimately a greater voice for workers at work. Indeed, the PATCO strike was hardly remarkable in any way. In our own decade, we have seen public-sector workers walk out several times over grievances basically identical to those of the PATCO workers, whether they were Chicago schoolteachers in 2012, New York City subway workers in 2014, or Philadelphia subway workers again in the same year. As public employees, PATCO workers were in an unfortunate position where their employer was the same body that writes and enforces the law. The state is predictably hypocritical when it comes to dealing with its own employees: while it maintains a general policy of non-intervention in allowing private-sector workers to strike, it does not extend the same rights to its own employees – in 39 states, it is illegal for public-sector workers to strike. Clearly, the state sees no conflict of interests in an arrangement where the body responsible for administering workers’ right to strike is also a body which employs workers. Despite the rather routine pattern followed by the PATCO workers, then-President Reagan made it clear that his goal was to break the strike and crush the union. Speaking as both the employer and the state executive, Reagan ordered PATCO workers to return to work at the threat of termination, on the very same day they had walked out. With only 1,300 air traffic controllers heeding Reagan’s warning, the strike lived on. On August 5th, Reagan summarily fired the remaining 11,500 workers and called in military air traffic controllers to replace them. Finally, on October 22nd, the government formally stripped PATCO of the right to legally represent workers as a labor union. To be clear, the government did not destroy PATCO. It did not raid its union halls, arrest its leaders, or murder its organizers. It merely stripped PATCO of the legal title of “union:” PATCO could no longer be considered the legal representative of workers. Very simply, in the eyes of the state, PATCO was no longer a union. As such, PATCO was only “destroyed” inasmuch as it relied on legal recognition for its existence. PATCO as a labor organization dissolved not from the result of state aggression, but due to its own over-reliance on state recognition. Labor law has transformed the landscape of labor organizing. Before labor law was introduced, labor unions relied exclusively on the collective power of workers to stop working. To “organize” a plant was simply to gain a majority of workers to become union members. The union would then approach the employer and declare, “Either give us better working conditions, or we will stop working until you do.” Labor unions were simply bodies created by workers to organize and coordinate their collective power. If the union was unable to initiate or enforce a work stoppage, it had no power at the bargaining table. The bargaining power of the union was thus totally dependent on the active participation of the workers. them. The government will then hold an election and, if the Union wins a majority of the votes, the Union is certified to be the legal representative of those workers. In this arrangement, unions rarely depend on inspiring workers to act collectively. Indeed, they do not depend on the worker or his/her power at all: their legitimacy is derived from government recognition, not from workers identifying the union with their interests. What happens if, like in the PATCO strike, the government takes away the Union’s right to legally represent workers at the bargaining table? For a union that relies on the law’s power rather than the workers’, this means immediate destruction. But for a genuine union of workers, this would make little difference. Genuinely, a labor union is nothing more than a coalition of workers uniting to gain power in their workplace. Workers do not need state recognition to organize their collective ability to shut down production. Where workers are organized enough to demand a union to be recognized as their legal representative, they do not need the law in the first place. Where workers are so disorganized to the point where they need legal recognition to force the employer to the bargaining table, they have no power at the bargaining table to begin with, as the only true power workers possess is their collective ability to stop or interfere with work. By abandoning shopfloor-level mobilization of workers, we are surrendering the only power we as workers possess. Now that a union’s bargaining power is tied to state recognition, the unions must obey the law to remain “legitimate” in the eyes of the government: if the state rules a strike illegal (as with PATCO), the Union must call it off or be decertified. The Union must further turn against its workers when they engage in collective activity which has been deemed illegal (sympathy strikes, boycotts and hot cargos, slow-downs). Ironically, it was “illegal” labor action like that of the PATCO strike which established these laws in the first place. Labor laws were not passed out of benevolence or good-will on the part of the state. Nor was it strategic political lobbying or campaign funding by unions which created these laws (no matter how much AFL-CIO leaders would like you to believe otherwise). No – faced with an increasingly militant and powerful labor movement, the state was forced to create a system which reigned in unions’ power. The laws that govern labor today, in every case, were introduced as emergency measure by business interests to halt the progress made by organized labor. collectively paralyzed shipping; commercial truck drivers shut down the city of Minneapolis (and 20,000 construction workers went on strike to support them), while factory workers in Ohio occupied their factories in a mass strike supported by leagues of unemployed workers. How did the state go from a policy of shooting strikers in 1934, to “guaranteeing” their right to strike in 1935? In one year, the police and military lined up behind the employers; a few months later, the state proclaimed that it cherished workers’ right to strike, and would defend that right from the employers. The National Labor Relations Act and other laws like it disarmed the labor movement and turned organizing into a stage-managed reenactment of genuine labor organizing. Thus, the state came to support striking, so long as these strikes were conducted within the parameters of laws which greatly reduced whatever threat was posed by organized labor to employers or politicians. Rather than gain the trust and confidence of workers, unions merely had to collect signed authorization cards; rather than rely on a mass work stoppage to enforce a contract or to oppose an unjust firing, unions need only to turn to the “impartial” labor courts. Labor law makes running a union much simpler for union executives, just as it makes dealing with unions much easier for employers and the state alike. Indeed, it would seem that labor law is beneficial for everyone except actual workers. Whereas labor law gives generously to employers, and concedes much (though conditionally) to unions, labor law has only curtailed the power of workers. Though it may be tempting to make the case that the state will only respond with an iron fist to public-sector unions, the truth is that both public- and private-sector unions must deal with the price of state recognition. The state regularly breaks strikes in the private sector – after all, it was the state’s iron-fisted response to private-sector strikes in 1934 which created these very laws! The trade-off between the comfort and security provided by the law, and the power it takes away from workers, is a price that all unions must grapple with – whether they are public or private, and whether they operate under the National Labor Relations Act, the Railway Labor Act, or any other labor law. Without state recognition, does the labor movement have the degree of workplace-level self-organization to survive? Indeed, if we took away state recognition altogether, would there be any real “labor movement” left? Depends on how you define a labor movement, right? If bound up in legalisms and contracts, perhaps. If it’s one that is willing to be bold and not subcumb to all the pressures of legalism, well, maybe not. What issues did President Reagan have to consider when he made his decision to fire the striking air-traffic controllers? Do you think he made the right decision? Explain why or why not.